To start analyzing the data in Lotus Notes Recovery Toolbox you should not install the Lotus Notes environment on your PC, it is necessary if you’d like to save the output data only. You need a file of *.nsf format that is all, it can be located on any disk in the local area network. This program is also compatible with all available versions of Lotus Notes, starting from 2003 and higher, it works on any PC and under any version of Microsoft Windows operating system. However, you may need the Lotus Notes application, installed on your PC, if you’d like to save the results of data recovery. The structure of newly created *.nsf files, made by Lotus Notes Recovery Toolbox, is fully compatible with the original structure of repaired documents. All user data, personal settings and other critical objects are also saved if these files were successfully found and identified. Lotus Notes Recovery Toolbox utility represents a simple and intuitive but powerful and efficient way of lost data recovery from corrupted files of *.nsf format. The key difference of Lotus Notes Recovery Toolbox consists in the fact that it uses an unique method of data recovery that does not affect the internal structure of input files in *.nsf format. One session of data recovery allows processing the only file of *.nsf format, you should go back to the first stage if you are going to open another file with specified extension and analyze this document in Lotus Notes Recovery Toolbox. You can download the unregistered version of Lotus Notes Recovery Toolbox right now and evaluate its capabilities on any PC running the Windows operating system. The size of Lotus Notes Recovery Toolbox is really small therefore its download does not take a lot of time even if your Internet connection is limited for any reason and parameters. The usage of Lotus Notes Recovery Toolbox in free demo version allows evaluating its simple interface, the speed of data processing and its efficiency as well, but you are unable to save the data from *.nsf files after the end of recovery. If you are satisfied with the efficiency of Lotus Notes Recovery Toolbox and with the ease of its usage, please purchase the full version of this utility, it removes all limitations of demo version and allows saving the data without any restrictions of free application. 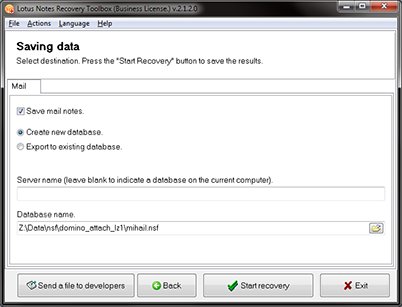 As soon as the process of data recovery is completed, if your copy of Lotus Notes Recovery Toolbox is already registered, the data can be saved either to the existing database or to another file of *.nsf format by selecting an appropriate option during the next stage after the end of analysis. After the completion of specified task, you may go to the next step and mark an appropriate checkbox, if you’d like to Create new database or Export to existing database. All objects from the selected file of *.nsf format that should be recovered, are transferred as is to another file of the same format. The files of *.nsf format are used to store some private information on user computers, in the case of damage the data from these documents can be restored by the Lotus Notes Recovery Toolbox program and export this information into an existing document of *.nsf format or use a clean file for this purpose. Thereby, your copy of Lotus Notes Recovery Toolbox should be registered, otherwise the recovery is not possible and you can look through the data only that was extracted from corrupted documents. Thanks to Lotus Notes Recovery Toolbox, you may considerably increase your chances of successful data retrieval from corrupted files of *.nsf format, used by Lotus Notes application, that could be otherwise completely lost. This way of data recovery does not require some kind of special skills, the interface of Lotus Notes Recovery Toolbox is so easy that you may start the recovery by simply following the guidelines of specified application, it is usually enough for the successfully completion of your job and to avoid possible errors. Lotus Notes Recovery Toolbox is one of the most reliable ways of data protection besides backing up your information, please use it if there are no other ways of retrieving the data from corrupted files of *.nsf format. Lotus Notes Recovery Toolbox do not repair content of encrypted Lotus Notes .nsf .mpp files.